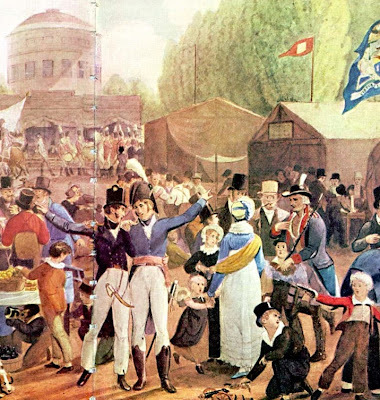 Many a European traveler crisscrossed the United States in the 1830s and 1840s, writing down their observations, scoffing and laughing when and where appropriate, or cheering on the bumptious new country. Tocqueville is the most famous. Charles Dickens and Frances Trollope also come to mind. But there are scores of others, too. (I've been trying to track down any travel record written by a Norwegian in the 19th century. Any help?) Reading their accounts is fascinating and illuminates what English, French, and German men and women of letters made of this loud, proud, rowdy new nation. Naval officer and British novelist Frederick Marryat (born , July 10, 1792, London—died Aug. 9, 1848, Langham, Norfolk, Eng.) was not pleased with the rough-and-tumble barbarities of the Americans and their seeming disinterests in real education and real cultivation. He thought it especially irksome that the egalitarian handshake was the universal greeting in the land. Was everybody here of the same station? How awful. So, to shed light on what some non-Americans thought about our national holiday and what it said about the country, I quote a passage here from Marryat's A Diary in America: With Remarks on Its Institutions (New York, 1839). Note the judgments about education and the mobocratic tendencies of the young country. "Lesson 62. "Story about the 4th of July. "6. "I must tell you what the people of New York did. In a certain spot in that city there stood a large statue, or representation of King George III. It was made of lead. In one hand he held a sceptre, a kind of sword, and on his head he wore a crown. 7. "When the news of the Declaration of Independence reached the city, a great multitude were seen running to the statue. 8. "The cry was heard, 'Down with it—down with it P and soon a rope was placed about its neek, and the leaden King George came tumbling down. 9. "This might fairly be interpreted as a striking prediction of the downfall of the monarchial form of government in these United States. 10. "If we look into history, we shall frequently find great events proceeding from as trifling causes as the fall of the leaden statue, which not unaptly represents the character of a despotic prince. 11. "I shall only add, that when the statue was fairly down, it was cut to pieces, and converted into musket-balls to kill the soldiers whom his majesty had sent over to fight the Americans." This is quite sufficient for a specimen. I have no doubt that it will be argued by the Americans: "We are justified in bringing up our youth to love our institutions" I admit it; but you bring them up to hate other people, before they have sufficient intellect to understand the merits of the case. The author of "A Voice from America," observes— "Such, to a great extent is the unavoidable effect of that political education which, is indispensable to all classes of a self-governed people. They must be trained to it from their cradle; it must go into all schools; it must thoroughly leaven the national literature; it must be line upon line, and precept upon precept, here a little and there a little; it must be sung, discoursed, and thought upon everywhere and by everybody." And so it is; and as if this scholastic drilling were not sufficient, every year brings round the 4th of July, on which is read in every portion of the states the act of independence, in itself sufficiently vituperative, but invariably followed up by one speech (if not more) from some great personage of the village, hamlet, town, or city, as it may be, in which the more violent he is against monarchy and the English, and the more he flatters his own countrymen, the more is his speech applauded. Every year is this drilled into the ears of the American boy, until he leaves school, when he takes a political part himself, connecting himself with young men's society, where he spouts about tyrants, crowned heads, shades of his forefathers, blood flowing Like water, independence, and glory. . . . I think, after what I have brought forward, the reader will agree with me, that the education of the youth in the United States is immoral, and the evidence that it is so, is in the demoralization which has taken place in the United States since the era of the Declaration of Independence, and which fact is freely admitted by so many American writer. . . . I shall by and by show some of the effects produced by this injudicious system of education; of which, if it is necessary to uphold their democratical institutions, I can only say, with Dr. Franklin, that the Americans "pay much too dear for their whistle." . . .
1. A regular classical education at college 1. Not required. 3. Preliminary examination in the classics, &c. 3. Not required. 4. Sixteen months' attendance at lectures in 2J 4. Eight months in two years, years. 6. Lectures on botany, natural philosophy, &c. 6. Not required. Tell us what you really think, Marryat! And now I'm off to an early Fourth of July picnic/frolic, where there will be loud, inarticulate toasts, booming music of the vulgar sort, long-winded orations, explosions, and democratic-style sport. We will shake hands when we meet each other on a level field.